Our range of classic road cycling holidays throughout Europe offer something to suit all abilities and passions from classic French routes to Italian masterclasses. France is bursting with options in the iconic Alps and Pyrenees and in Italy the Dolomites will challenge the best amongst us. If you're super keen and wanting to really ride like the pros, we recommend you take a look at our challenging RAID holidays. If you enjoy taking in the finer things in life then why not try our mid-graded tours in Italy and Spain. Or for those looking for longer tours, then our Iconic Journeys include St. Malo to Nice, the Grand Traverse in Italy and Spain's Del Norte el Sur. With some of the best cycling tours in Europe on offer you're sure to find just what you're looking for. 22 Jun to 06 Jul - Our ‘Channel to Med’ cycling tour takes you from Brittany’s St Malo shoreline and doesn’t stop until we reach the dazzling glamour of Nice on the French Riviera. 04 to 19 May - Take a ride through no less than 14 natural parks and many more areas of natural beauty! It's an ultimate cycling adventure in Spain. 08 to 23 Jun - You will experience the subtleties of the varied landscapes of Spain, cuisines and cultures through which we pass and cross several mountain ranges along the way! 13 to 27 July - Join us on this unique cycling odyssey, taking you through not one but two of Europe's most prestigious cycling destinations! 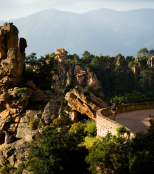 The post Roadie heaven in Corsica… appeared first on Skedaddle Blog. The post 3 of the most scenic road cycling routes in Europe appeared first on Skedaddle Blog. The post 3 ways to bag yourself a grand tour climb in 2016… appeared first on Skedaddle Blog.